Hiren D Parmar, Moolchand Prajapati, Rashmikant Shah. Introduction: The peptic perforation is one of the commonest abdominal surgical emergencies. Common causes are H.pylori, increased inadvertent use of NSAIDS, smoking and stress of modern life. During last few years there has been great revolution in availability of the newer broad spectrum antibiotics, better understanding of disease, effective resuscitation, prompt surgery under modern anaesthesia techniques, and intensive care unit resulted in reducing the mortality. Materials and methods: This prospective study was carried out in the department of surgery during period from 1st May 2009 to 30th November 2011. All were indoor patients with diagnosis of peptic perforation in stomach and/or duodenum excluding other sites. Each patient was study in detail with relevant clinical history, examination, laboratory investigations and management. The study comprised of total 50 patients operated for peptic perforation by various modalities. Results: the middle age group was commonest. Smoking, alcohol and stress were common etiological factors. The perforation was common in anterior surface of the first part of duodenum. Wound infection and bronchopneumonia were common post-operative complications. Discussion: The duration of perforation more than 24 hours and size of the perforation more than 1 cm has increase morbidity & mortality. Early diagnosis and prompt management of shock & septicaemia is important for better prognosis of patients. The simple closure with omentopexy of peptic perforation still remains the first choice as a treatment. H-pylori eradication treatment is mandatory after simple closure of the perforation to prevent recurrence of ulcer. 1. Torab FC, Amer M, Abu-Zidan FM, Branicki FJ. 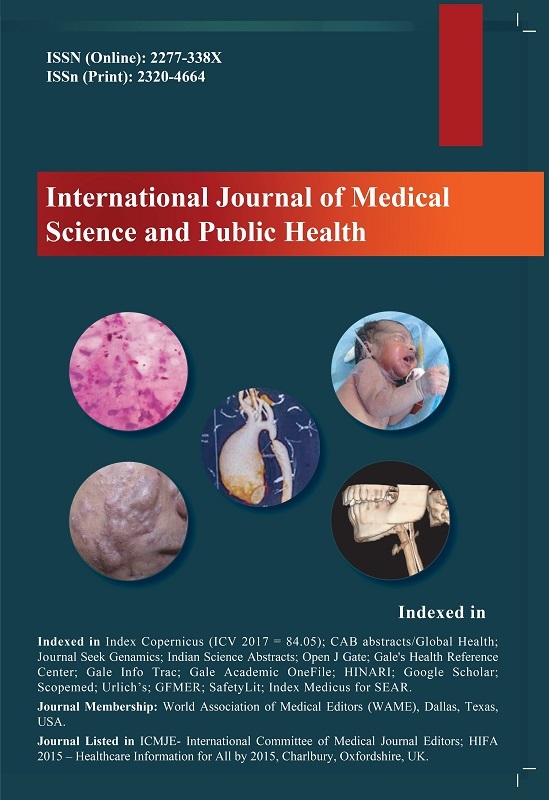 Perforated peptic ulcer: different ethnic, climatic and fasting risk factors for morbidity in Al-ain medical district, United Arab Emirates. Asian J Surg 2009;32:95-101. 2. Aga H, Readhead D, Maccoll G, Thompson A. Fall in peptic ulcer mortality associated with increased consultant input, prompt surgery and use of high dependency care identified through peer-review audit. BMJ Open 2012;2:e000271. 3. Nuhu A, Madziga AG, Gali BM. Acute perforated duodenal ulcer in Maiduguri: experience with simple closure and Helicobacter pylori eradication. West Afr J Med 2009;28:384-7. 4. Michelet I, Agresta F. Perforated peptic ulcer: laparoscopic approach. Eur J Surg 2000;166:405-8. 5. Tomtitchong P, Siribumrungwong B, Vilaichone RK, Kasetsuwan P, Matsukura N, Chaiyakunapruk N. Systematic review and meta-analysis: H. pylori eradication therapy after simple closure of perforated duodenal ulcer. Helicobacter 2012;17:148-52. 6. Dakubo JC, Naaeder SB, Clegg-Lamptey JN. Gastro-duodenal peptic ulcer perforation. East Afr Med J 2009;86:100-109. 7. Plummer JM, McFarlane ME, Newnham. Surgical management of perforated duodenal ulcer: the changing scene. West Indian Med J 2004;53:378-81. 8. Bin-Taleb AK, Razzaq RA, Al-Kathiri ZO. Management of perforated peptic ulcer in patients at a teaching hospital. Saudi Med J 2008;29:245-50. 9. Lobankov VM. Population heaviness of peptic ulcer disease: causing factors. Eksp Klin Gastroenterol 2010;11:78-83. 10. Andersen IB, Jørgensen T, Bonnevie O, Grønbaek M, Sørensen TI. Smoking and alcohol intake as risk factors for bleeding and perforated peptic ulcers: a population-based cohort study. Epidemiology 2000;11:434-9. 11. Kocer B, Surmeli S, Solak C, Unal B, Bozkurt B, Yildirim O,et al. Factors affecting mortality and morbidity in patients with peptic ulcer perforation. J Gastroenterol Hepatol 2007;22:565-70. 12. Dakubo JC, Naaeder SB, Clegg-Lamptey JN. Gastro-duodenal peptic ulcer perforation. East Afr Med J 2009;86:100-9. 13. Nuhu A, Kassama Y. Experience with acute perforated duodenal ulcer in a West African population. Niger J Med 2008;17:403-6. 14. Tsugawa K, Koyanagi N, Hashizume M, Tomikawa M, Akahoshi K, Ayukawa K, et al. The therapeutic strategies in performing emergency surgery for gastroduodenal ulcer perforation in 130 patients over 70 years of age. Hepatogastroenterology 2001;48:156-62. 16. El-Nakeeb A, Fikry A, Abd El-Hamed TM, Fouda el Y, El Awady S, Youssef T, et al. Effect of Helicobacter pylori eradication on ulcer recurrence after simple closure of perforated duodenal ulcer. Int J Surg 2009;7:126-9. 17. Subedi SK, Afaq A, Adhikary S, Niraula SR, Agrawal CS. Factors influencing mortality in perforated duodenal ulcer following emergency surgical repair. JNMA J Nepal Med Assoc 2007;46:31-5. 18. Lau JY, Sung J, Hill C, Henderson C, Howden CW, Metz DC. Systematic review of the epidemiology of complicated peptic ulcer disease: incidence, recurrence, risk factors and mortality. Digestion 2011;84:102-13. 19. Kim JM, Jeong SH, Lee YJ, Park ST, Choi SK, Hong SC,et al. Analysis of risk factors for postoperative morbidity in perforated peptic ulcer. J Gastric Cancer 2012;12:26-35. 20. Chalya PL, Mabula JB, Koy M, McHembe MD, Jaka HM, Kabangila R,et al. Clinical profile and outcome of surgical treatment of perforated peptic ulcers in Northwestern Tanzania: A tertiary hospital experience. World J Emerg Surg 2011;6:31. 21. Bashinskaya B, Nahed BV, Redjal N, Kahle KT, Walcott BP. Trends in Peptic Ulcer Disease and the Identification of Helicobacter Pylori as a Causative Organism: Population-based Estimates from the US Nationwide Inpatient Sample. J Glob Infect Dis 2011;3:366-70. 22. Coluccio G, Fornero G, Rosato L. [Our experience in the surgical treatment of perforated peptic ulcer]. Minerva Chir 1996;51:1035-8. 23. Rajesh V, Chandra SS, Smile SR. Risk factors predicting operative mortality in perforated peptic ulcer disease. Trop Gastroenterol 2003;24:148-50.